EGR was created in 2012 to improve the most forgotten aspects of musical instruments and to look for alternatives to enhance the performance and experience of musicians. EGR has become famous and prestigious worldwide thanks to its range of ligatures. They are 100% designed and made by Enrique Gómez Rodríguez. Enrique was born in 1990 in Peligros (Granada, Spain) and he started his career with the saxophone when he was 8. With this instrument he obtained a Professional Music Degree in the Professional Music Conservatory Ángel Barrios of Granada. During that period, he had great teachers that made him to admire the saxophone even more. Due to his great command and virtuosity, he was selected to represent this Conservatory in the event of novel music in 2005, in which he received a great acknowledgement thanks to his performance. He also participated in the 7th Soloists’ Competition of the Conservatory in 2007 and received the Art award given by the Pulianas City Council (Granada). Among others, the most important events he took part in are different soloists’ concerts of the Municipal Music Band of Pulianas (BMMP), together with his participation in FEX (extension of the International Festival of Music and Dance of Granada). In 2009 he collaborated with the Municipal Music Band of Granada and took part in the "Terry Riley: in C" concert given in the Contemporary Art Museum of Málaga. His keenness to learn and work together with his creativity and his great attributes as a saxophonist are reflected in all the offers he receives to be part of different music bands. Among others, he has been a member of the Symphonic Band of Granada, Jabacín group, BeFunkBop or Jairom Black Quintet. Nowadays is an active member of the Santa Fe Big Band (directed by the saxophonist Agustín Sánchez), Gold Black Jazz or the BMMP. Since 2011 he has been a saxophone teacher in the prestigious Experimental Music School of Granada and in the BMMP. Over the last years his life has changed drastically thanks to his research into the saxophone and the improvement of its sound. This has made him to develop and patent his own ligatures which soon spread thanks to the best saxophonists of the world. With the acknowledgement of these people, he improved himself as a saxophonist and continued with the development of his ligatures. 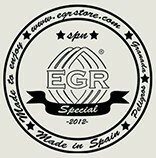 Since that moment, EGR has exported them together with other accessories to different countries all over the world like Portugal, France, Italy, Germany, Belgium, United Kingdom, Holland, Luxembourg, Turkey, Japan, Russia, China, Australia, Thailand, Chile, Mexico, Puerto Rico, United States, Colombia, Argentina, etc. His successful and recognized worldwide ligatures are a benchmark in the world of ligatures. But his research did not stop at this point. He has done research into new accessories like the Alhambra mouthpiece for alto and tenor saxophone, barrels for clarinets, greases and reeds (which are made in France but are designed and packed in Granada). Customers can obtain all these accessories in the official website or in the updated online store. For all this, the international company Forestone-Japan, which is the most important in its field, noticed his work and appointed him official endorser of its brand. Thanks to this appointment, he is part of the world’s most famous musicians and that allows him to try new prototypes before they are launched. e-commerce as he understands the needs of every customer perfectly. For that reason he becomes an essential part of this website, which is made for our customers from all over the world. Besides We have a business consultant to serve large stores and distributors worldwide. She is Pilar Cruz.